1999: The design included the installation of thirteen (13) emergency generators at each of the Boroughs’ pumping stations and an 800KW and 400KW generator to power the entire wastewater treatment plant. 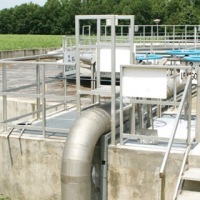 2002: The design included the removal of flowmaster control systems and the installation of three (3) new 150HP VFD’s for the raw sewage pumping station. 2002: This project included a new UV system and dual 600A power feeds from the facility’s main 480V-2000Amp switchgear.